The year is 2154. The Earth has long been pillaged of its resources and habitability. Looking to solve this impending energy crisis, a human colony has been mining for the valuable mineral unobtanium for three decades on Pandora, a distant Moon of the Alpha Centauri-A star system. At 4.4 billion light years away, travel to Pandora requires six years of arduous travel in cryogenic hibernation. Although possessing an Earth-like environment, Pandoras atmosphere is toxic. Furthermore, native denizens, a humanoid Naavi tribe, present a direct threat to humans, due both to their advanced biomechanical structure and animosity towards their occupiers fixations on what they feel is their sacred native land. In order to explore the territory safely, human being drivers must virtually connect their consciousness to a physical avatar hybrid composed of 50% human DNA and 50% Naavi DNA. Referred to pejoratively by the Naavi as the sky people, human imperialists become increasingly aggressive about destroying native territory to harvest unobtainium, leading to perilous tensions between the two groups and the brink of all-out war. 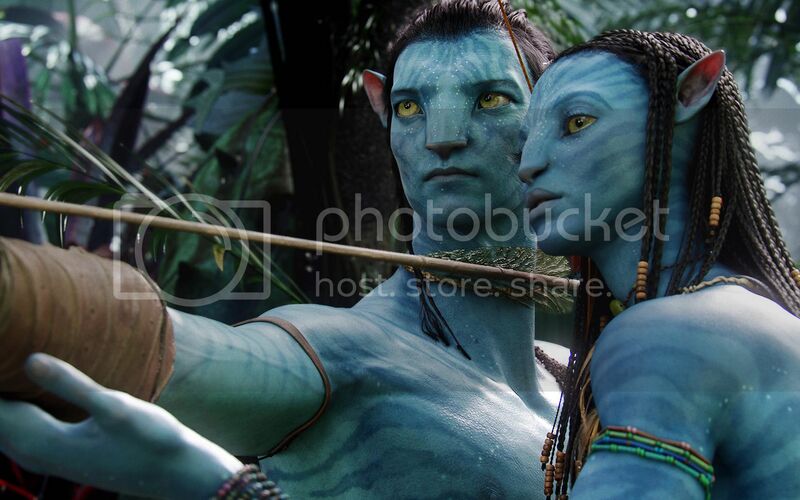 Neytiri teaches Jake how to shoot a bow and arrow, in a scene from Avatar. ©2009 20th Century Fox, all rights reserved. Enter Jake Sully (Sam Worthington), an accidental everyman hero and paraplegic ex-Marine. No doubt an ode to Camerons own brother John David, who served in the first Gulf War and even helped train Worthington for the role, Sully is lacking in mobility but still a warrior at heart. After the death of his twin brother, a scientist at the Avatar Program, Sully is the only one whose DNA matches and can drive his brothers Naavi avatar. Overly eager to use his new virtual body, Jake gets trapped on Pandora and saved by the beautiful Princess Neytari (Zoë Saldana). Far from viewing him favorably, she cant ignore an auspicious sign from the Naavi deity Eywah that Jake must become one of them and learn their ways. This is music to the ears of chain-smoking tough-as-nails head scientist Dr. Grace Augustine (Sigourney Weaver, flawless), who sees this as an opportunity to study the Naavi in an unprecedented way. Colonel Miles Quatrich, a despotic Rambo played with jingoistic abandon by Stephen Lang, recruits Sully as special ops to learn the Naavi weaknesses and where they may be infiltrated. Mediating the two camps is Resources Development Administration agent Parker Selfridge (Giovanni Ribisi), an insipid corporate monger who will work with whichever side leads to the unobtainium.’ The scientists interests are purely the biology of Pandora and forging diplomacy with its peoples, the military to wield might (shock and awe, anyone? ), and the RDA to make as much money as possible. Jake is caught between arbitrating these opposing human interests as he connects spiritually with the natural beauty of Pandora and falls in love with Neytiri. He must choose which side he will fight for and where his loyalties lie. We have already written extensively earlier this week about the scientific and technological breakthroughs in the making of Avatar in our post entitled Behind Avatar: Science, Technology, Art and Design. This review is primarily concerned with its artistic achievements, which are significant. While some of Camerons derivative dialogue is a consistent weakness in his screenplays, he makes up for it with rich characters and familiar archetypes, particularly his trademark strong woman (in this case fulfilled dually by Weavers Augustine and Saldanas Neytiri). Augustine is the kind of knowledgeable, authoritative female scientist we wish would get portrayed in mainstream film, and is equal parts firm with the inexperienced non-scientist as she is empathetic with his journey to Naavi manhood. Neytiri is an exceptionally complex female lead, and a big credit to Saldana for a nuanced performance filmed in a virtually empty box. Neytiri teaches Jake to hunt, survive, and roam the treacherous land with a strong hand, but opens his eyes to where the true sacred wealth of her world liesin respect for the Earth, the animals, the spirit and the biology, not what lies in the ground. Rounding out the cast are terrific CCH Pounder as Moat, Neytiris mother and Naavi matriarch, Michelle Rodriguez as the rogue helicopter pilot Trudy Chacon (whose conscience leads to a very important role towards the end of the film), and Joel David Moore as über-nerdy scientist Norm Spellman, Jakes Naavi language coach. The highlight of Avatar, and the price of admission, is the surreal beauty of the viewing experience and CGI melded seamlessly with live-action sequences shot in stereoscopic 3D. Camerons genius directing avoids the over-the-top action of Terminator or melodrama of Titanic to let the surroundings play a key role, if not the major role, in the film. He went to great lengths to create a unique flora and fauna for Pandora and he lets them shine. Nighttime scenes shot in bioluminescent forests, each footstep lighting a path on mystical trees, collapsing flowers, fluorescent foliage, fruit of impossibly vivid color, are nothing short of magical. Certain panoramic shots or flying sequences transported The ScriptPhD to childlike wonder, slack-jawed and only capable of a primitive ooooooh or ahhhhhhhh. Animals, eliciting enormous respect in the Naavi culture, are at the epicenter of this film. The entire ark of Camerons creations, ranging from the most powerful Tyrannosaurus-like behemoth to the most delicate winged creature, is designed with precision and detail. By far the most critical of these is the banshee, a dragon-horse-eagle hybrid that must be tamed individually by each Naavi before being adopted as a flying vehicle. Technical prowess in the penultimate human-Naavi and banshee-military vehicle battle sequences are near perfection and can easily vie with the most beloved war movies of all time. So put on your 3D glasses, sit back, and prepare yourselves to be transported to an unimaginable universe. 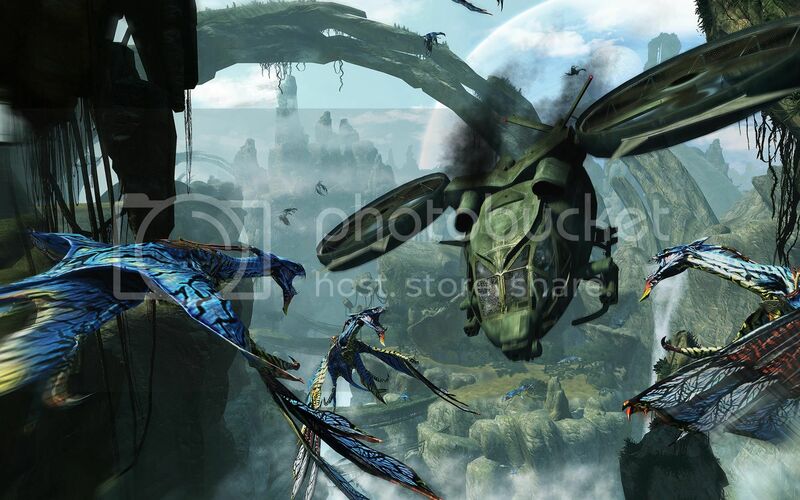 Na'avi banshees colliding with military helicopters on Pandora, in a scene from Avatar. ©2009 20th Century Fox, all rights reserved. textbook. We are all grateful beneficiaries of the realization of his dream. 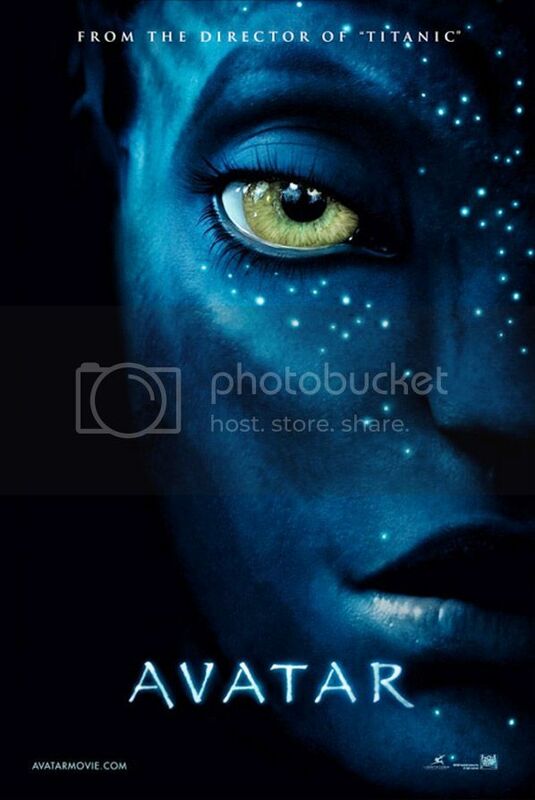 Avatar goes into wide release in IMAX and theaters nationwide on December 15, 2009. I loved it, but I definitely saw that it had a few major flaws. The first being that Cameron did better character development with more characters in less time in Aliens. The second was that, while it was filled with writing risks that didn’t exactly fail, the pacing was off in act one. I think I’m more or less in your camp, Bryy, even though my review was slightly forgiving. I did mention that the screenplay has problems. It has ALWAYS been Cameron’s glaring weakness. The thing is, the movie is such a comprehensive achievement and so sets a new pinnacle for 3D and technical mastery that I was willing to overlook that flaw. But yes, character development was not the priority of Avatar. As there is a lot more information in your review than is given in the movie, I’m assuming you’ve read the book. Could you tell me what it’s called and who wrote it? Hey Anamita, the review itself is based on the movie, but all the technical, science and design information was derived from the Pandorapedia, which will be released this winter, and “The Art of Avatar” (Abrams Books) by Lisa Fitzpatrick, James Cameron and Peter Jackson. Highly, highly recommended read. I get sick of the constant problem with tall poppy syndrome on the internet. Because Cameron has made such a fantastic achievement, everyone needs to drag it through the ringer. I completely agree with you on this one – the cinematic achievements and technological advances made with Avatar far outweigh some clunky dialogue. It was a great film which could be enjoyed by all audiences, and the effects..well they just speak for themselves. I was blown away, and the dialogue certainly didn’t protract from my enjoyment of the film one bit. Thank you so much for this most thoughtful and insightful comment, spacedmuch! Always appreciate knowledgeable movie fans letting us know how they feel. Can’t agree with you more. Tough to expect perfection out of a movie, but Cameron came close. I have to disagree with you a bit on the dialog on script development, ScriptPhD. The dialog’s not necessarily bad, in my opinion. At least not overall. There’s about five lines that i didn’t care for, but it’s not like some films were it didn’t make any sense for a character to say that particular horrible line (actually, I take that last part back. “Shut your pie hole” was a bit jarring). But all in all, it’s pulpy. And it was written in a nice, pulpy manner. It made me think of the best works of Burroughs, Howard, or Kipling, though unlike Burroughs or Howard, Cameron actually gave the characters their own unique voices. While at times a bit derivative, I liked what the characters said to each other and the chemistry they had. It’s certainly more competent than a lot of writing that’s been done for big-budgeted Hollywood films. What the characters said was never a throwaway line. And accept for maybe one or two places where Cameron may have hammered the message a bit too much, it never got on the nose. What gets said is very blunt, but it’s never on the nose. As for character development, I thought there was enough in the film. Jake had an interesting arc, and it was cool to see Neytiri’s perceptions about (one) human change from their first introduction to that last moment where she saves Jake’s human body. And the relationship between Grace and Jake I thought worked as a nice, convincing maternal one. I’m still thinking about the moment where she helps him into his cot after he’s fallen asleep doing a video log. That’s something I think a lot of people can relate to because their mom’s either did the same thing for them, or because they are moms who’ve done that for their children. As for the other characters, they are developed ot a lesser degree, but you never lose sight of their motivation. Also, I think of lot of the character development that was present was maybe too well integrated into the story (Joel David Moore’s character comes to mind). I would have preferred to see more obvious character moments. And I would have liked it if Wes Studi’s character had a bit more to do. But, overall, it didn’t distract me from the film. Sure, the character sre archetypes, but they’re nicely developed archetypal characters. That’s what Cameron has always done best. All in all, tough, I’m just glad an earnest, simple fantasy film was made. It’s been a long time since the LotR ended, and I don’t think I’ve loved a fantasy film as much since that excellent trilogy concluded. i personally thought the film was really good, although i feel that it could have ended a little earlier then james cameron could have made more money. there are a couple of flaws in avatar such as arms moving from one place to another without phisically having time to do so. overall the film was great even though i had a numb bum by the end of it!